Today’s PM edition will be about the crocodiles of Banco Chinchorro. I found this article the other day, and it was good, and full of information about the crocodiles here. Trust me they are everywhere here and Belize, and play a vital part in the ecosystem here. So you might find this interesting. Reliable encounters with American crocs are possible at Mexico’s pristine Banco Chinchorro. When divers talk about the ­big-animal ­encounters they’ve dreamed of or ­experienced, the conversations often conjure ­images of powerful, predatory fish like sharks and marlin, or ­massive marine ­mammals like whales and sea ­ lions. 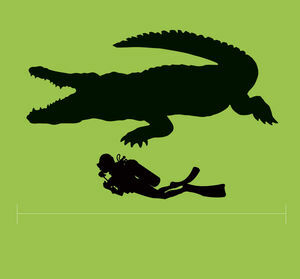 Crocodiles rarely ­enter the picture — which, in the eyes of ­adventure ­seekers, is a ­sizable oversight. There are 14 species of crocodile found around the world, and they’re most often associated with murky, swampy regions like ­Africa’s ­Okavango Delta, where Nile crocodiles hunt with ­ruthless efficiency. But not all of these toothy predators live in ­fresh ­water. Australia is well-known for its massive ­saltwater crocs. They’re the largest living reptiles on the planet — growing up to 20 feet long — and they prowl the coastline, along with inland rivers and billabongs, sometimes even ­swimming far out to sea. Though knowledge about ­Aussie crocodiles’ ­tendency ­toward ­seawater is relatively widespread among ­divers and nondivers alike, far fewer realize that ­American crocodiles do the same thing. Slightly smaller than their relatives Down ­Under, American crocodiles grow to around 15 feet long over their 70-year lifespan and weigh up to a ton. They ­inhabit a wide range of locales, from the Everglades in southern Florida to many parts of the Caribbean, Mexico, and Central America and South America. In fact, the world’s largest known population of American crocs is found in the Dominican Republic, near the Haitian border, where they live in a landlocked saltwater lake called Lago Enriquillo. American crocodiles grow to around 15 feet long over their 70-year lifespan. 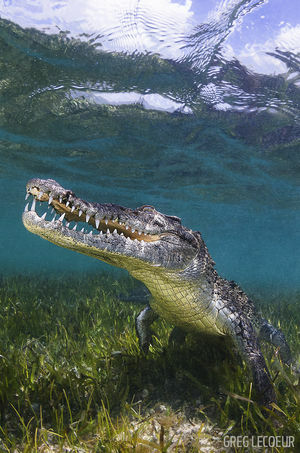 Those with the salt to ­encounter these prehistoric predators in their ­underwater environment shouldn’t set their sights on the Dominican ­Republic, because there’s only one place where ­people can ­reliably swim alongside ­American crocodiles in warm, clear water: Mexico’s Banco Chinchorro. Located off the ­southern Yucatan peninsula, ­Banco Chinchorro is the ­largest atoll in the ­western ­hemisphere. 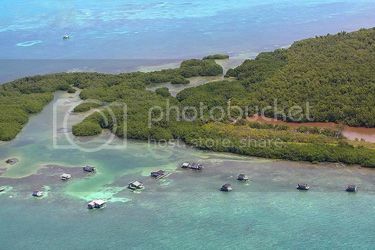 Atolls are rings of coral reef with shallow lagoons inside and steep drops outside, and ­Banco Chinchorro is part of a unique ­collection found along the Mesoamerican Barrier Reef, which includes the atolls of ­nearby Belize. Topside, this ­UNESCO Biosphere Reserve is home to a handful of seasonal ­fishermen who have ­makeshift huts on the low-lying islets. Some offer Spartan ­overnight ­accommodations for ­visiting divers. The reefs and wrecks ringing the outside of the atoll offer thrills for scuba divers, but encounters with crocodiles are snorkel-only experiences. The crocs generally split their time between sunbathing on the beaches and cruising the sea-grass beds that grow in the shallow interior of the lagoon, where the water is only a few feet deep. These experiences are generally segmented into small groups of ­snorkelers, with divemasters in front and back to serve as ­lookouts while the group watches and photographs these ­unusual creatures. Most of the time the crocs remain fairly placid. 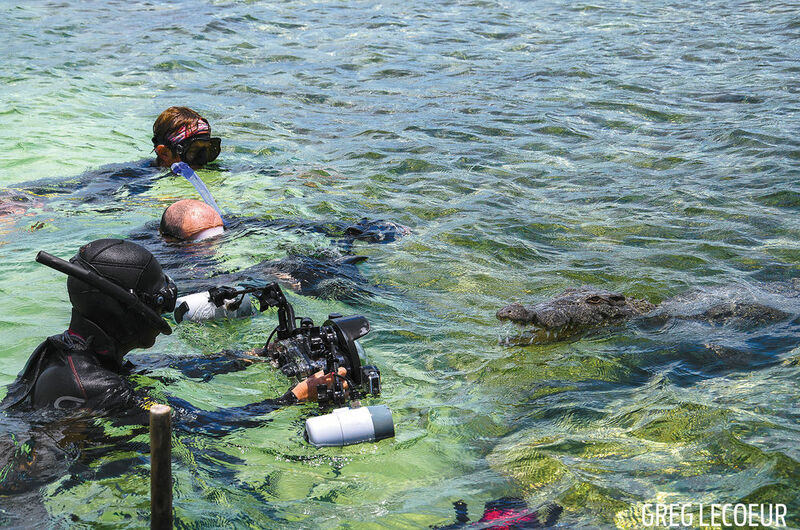 Underwater photographers looking for amazing photos of crocodiles head to Banco Chinchorro, Mexico, for up-close encounters with these reptiles. Fun Fact: Crocodiles lay between 10 and 60 eggs at a time, and hatchlings live in their eggs for 55 to 110 days. Man this computer is fast, and more features than my last by a mile. So until later.